Hello | Aren't you hot in that? Bought up nominally as Presbyterian (Christianity with Scottish roots) in the suburbs of Sydney, Australia, for the past 15 years I have been Muslim and have worn the headscarf – the veil, the hijab. Now – it is to my own surprise that I find myself blogging about wearing the scarf. The religion of Islam is vast and rich, simple yet deep, challenging yet easy, wondrous and fulfilling to the human soul. The hijab to me, I guess, faded into the background a long time ago. It seemed such a small part of a much bigger picture, akin to slipping on a pair of ballet flats & grabbing keys, phone & wallet before leaving the house. So the media driven overblown focus on a square metre of flimsy fabric has only served to irritate me immensely! But perhaps I’m over feeling annoyed. Perhaps I’ve come to see a funny side. 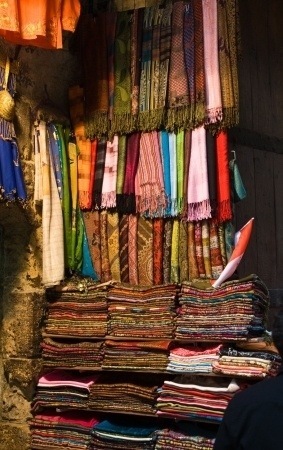 Perhaps frustration has made me want to tell all and sundry everything about life in a scarf. If you can’t beat em’, join ’em. Perhaps the fascination/irritation/misunderstood-ation is in fact the start of a great conversation. Perhaps I have remembered how, back in my early days of learning about Islam, that I too; thought wearing a scarf was a pretty big deal. So for those with a keen or vague interest, insomnia or just web wandering whilst watching a rerun of The Love Boat, insha’Allah (God willing) I tell you all about My Life In Hijab. And if you hang in there, I will also answer that twenty thousand dollar question – Aren’t you hot in that?